In the corporate world you may find yourself facing an elephant in the middle of the office. Having an elephant in the office is a metaphor for living with a huge issue. And that’s true whether you’ve seen the elephant or haven’t seen it. Those who have seen the elephant, sometimes, somehow, manage to avoid it; showing how challenging the prospect of facing the world’s most dangerous mammal can be felt. Avoidance and denial becomes a way to escape from tackling the elephant. But the elephant is huge. It fills the whole office and it stinks to high heaven. It’ll be difficult, if not impossible, to work effectively as long as it’s in the office. Leading managers are stuck in the mindset Inside-out rather than Outside-in. Customers and prospects are considered disturbing rather than nourishing. Complacency is everywhere. Improvement initiatives go on the backburner. Many managers acts as if their business processes are already perfected. Targets are set low. There is no effective quality assurance to separate food from filth. Sloppy work is considered good enough. How do you get the elephant out of the office so you can move on with business? Clearly not by avoiding it, that’s for sure. The ongoing political dynamics in the workplace makes it easier for employees to voice their opinion. Even so, many people prefer keeping quiet and go with the flow; thinking that is the best way to advance and win the political gaming that takes place at work. For others it’s a survival mechanism. The dilemma with keeping quiet is that you allow others to define your voice and identity. Passivity contributes to fatten the elephant. What you do becomes a question of who you are or who you want to be? The only thing necessary for the elephant to triumph is that good people with integrity do nothing. If you accept that an organization is made up of people, then you’ve to accept that people are necessary for getting the right things done. 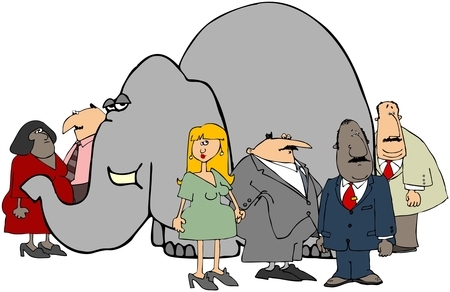 When people with integrity becomes aware of the elephant and its damaging effects on business, their wellbeing and career there are only two options: 1) Change employer or 2) Get rid of the elephant. If you choose to get rid of the elephant and doing the ethically right thing does however not mean that you can just lead it out. You must prepare for resistance. Integrity in business isn’t for the fainthearted. Those who placed the elephant in the office and fed it will hardly admit their guilt. To try hiding mistakes is a protective mechanism particularly strong among those who feed elephants. The elephant supporters first line of defense is probably to ignore you. If that doesn’t work, they’ll will backbite their opponents. So don’t be surprised when they put degrading labels on your person and say things like: “It isn’t like that. He has vivid imagination. He leaves out essential facts. Don’t listen to him”. Their lack of basis in reality and objectiveness may seem provocative. It’s nevertheless important not to let yourself be dragged down to their level of argumentation. When analyzing the elephant it’s recommended to involve some colleagues both for verification and support. The guy who says “we can do this” always trumps the one who only sees difficulties. Pick allies that are reliable and action-oriented. You don’t get any points for being too subtle. Going too hard is not either recommended. Your report must shine – which means it should be interesting, understandable, logical and to the point. The more these criteria are met; the better chance to successfully eliminate the elephant. Where does the elephant come from? It can come from many places, of which one is that a senior manager in the organization have forgotten why the company exists and what must be done to ensure its continued existence. The business objective of most companies isn’t about internal meetings. An organization built around empty chatter and pushing papers instead of innovating and creating value for customer, employees and shareholders has lost its meaning. What’s the best way to keep your office clean from elephants, stay competitive and grow? In my next blog post I’ll suggest what you can do within your organization to create and nourish a culture that again and again delivers growth, business results and successful customer outcomes. Right here is the perfect web site for anybody who hopes to understand this topic. You understand so much its almost hard to argue with you (not that I actually will need to…HaHa). You definitely put a new spin on a topic which has been discussed for many years. Excellent stuff, just great! Thanks for your nice words. Having an elephant in the office is a challenging situation. Looking back, I sure wish it would not have happened to me. Dealing with it was not easy. So that is my motivation: If my experiences from dealing with elephants at the office can help others dealing with it – great!